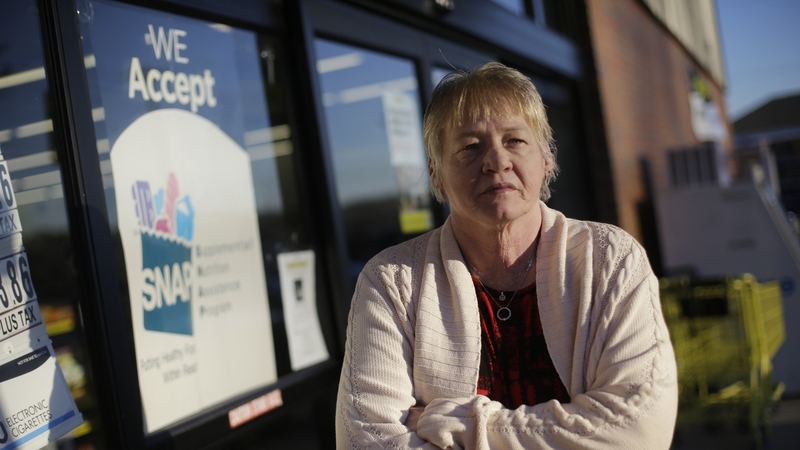 For More Than A Million Food Stamp Recipients, The Clock Is Now Ticking : The Two-Way There's a three-month cap on SNAP benefits for unemployed, able-bodied adults, but it was waived in many areas after the recession began. In 22 states, the time limit kicked back in this month. On Friday, Terry Work stands outside a store that accepts food stamps in Bon Aqua, Tenn. Work's 27-year-old deaf son recently was denied disability payments, meaning he is considered able-bodied. Now he stands to lose his food stamps, even though he has trouble keeping a job because of his deafness, she says. Work requirements began kicking in this month for a million SNAP benefit recipients. One month down, two to go. For unemployed adults in 22 states, that's how long they can count on help with the grocery bills: Starting this January, they have three months to find a job or lose their food assistance. SNAP benefits — formerly known as food stamps — have been tied to employment for two decades. Unless they are caring for children or unable to work, adults need to have a job to receive more than three months of benefits. But after the recession began, that three-month cap was waived in many areas, as state and federal governments acknowledged that jobs were hard to come by. Now, as the economy is improving, the time limits are being reimposed — by federal policy in some areas, by state legislators in others. For 22 states, the time limit returned in some or all of the state at the beginning of this year. It's the largest reinstatement of the three-month cap since the recession, The Associated Press reports. The three-month time limit applies to people ages 18 to 50 who aren't caring for a child or other dependent, aren't pregnant and aren't disabled or otherwise prevented from working. After their three months are up, such recipients must be working or in a training program at least half-time (80 hours a month) to receive SNAP benefits. States are encouraged to offer job training, worker placement and work programs for job-seekers receiving SNAP benefits, but they are not required to. In order to waive the time limit, states generally need to prove a region has an unemployment rate above 10 percent, a surplus of workers as acknowledged by the Department of Labor or unemployment rate 20 percent higher than the national average for two years in a row. A region that qualifies for extended unemployment benefits can also waive the time limit. Even when the time limit is waived, the overall work requirements attached to SNAP benefits still stand: Recipients need to demonstrate that they are looking for a job, and need to take any reasonable job that is offered to them. Once the time limit kicks in, able-bodied, childless and unemployed adults are limited to three months of food aid every three years, even if they are actively looking for a job and have not been offered one. "Federal figures show that many in this category are single adults, with slightly more men than women. Case studies have shown they are less likely than the general population to have high school diplomas and valid driver's licenses. Advocates say some are homeless, recently released from prison or dealing with trauma from military service, abuse or violence in their communities — all of which can make it harder to get a job." This January, six states reimposed the time limit on all their SNAP recipients: Arkansas, Florida, Mississippi, Missouri, New Jersey and Tennessee went from statewide waivers to no waivers at all. Sixteen others had a statewide waiver last year and are now enforcing the time limit in some areas: Alabama, Alaska, Arizona, Connecticut, Georgia, Idaho, Kentucky, Maryland, Massachusetts, New Mexico, New York, North Carolina, Oregon, Pennsylvania, Washington and West Virginia. In most cases, the time limit is returning because the states were no longer eligible for a waiver. But Mississippi, New Mexico and West Virginia are eligible for a statewide waiver based on their unemployment rates and are choosing not to implement it, reports the Center on Budget and Policy Priorities, a progressive think tank. The number of SNAP recipients governed by the time limit will soon rise again. South Carolina, which is currently covered by a statewide waiver, has only requested it through March, Pew reports.